I designed this folder using entirely Free Sale-a-bration stamp sets on promotion with any $100 order or Workshop over $600 until the end of March. 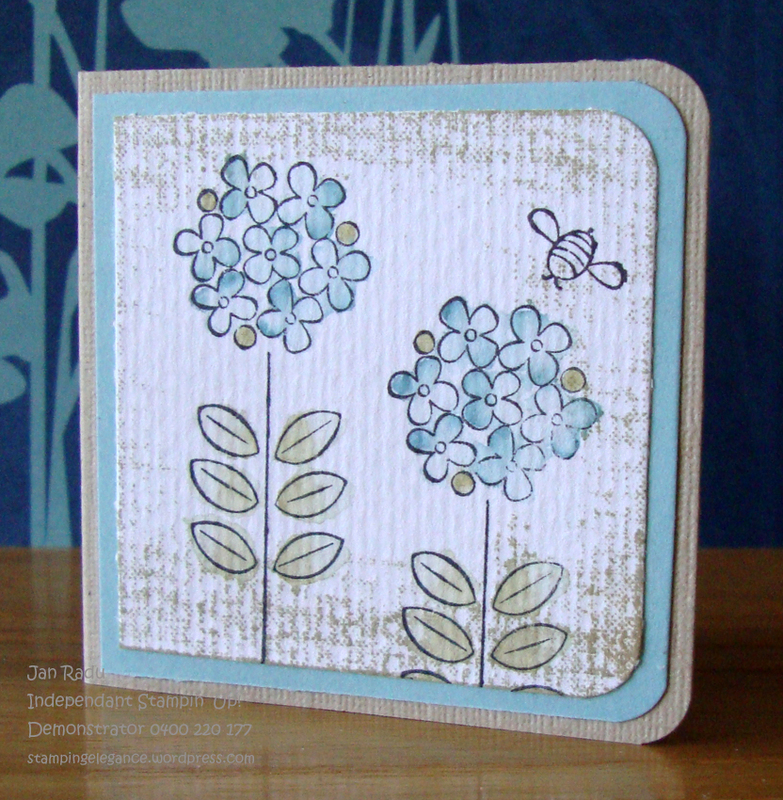 Note: for ease of supplies all white card used for stamping on is water colour paper – I like the texture and decided to use it for that reason. Fold on all score lines making sure that the 2cm spine is on your left and the 1cm spine is on your right. Secure each pocket with sticky strip. Run front mat through the Square Lattice textured embossing folder and spray with Night of Navy Shimmer Mist – dry off with heat tool for quick assembly. 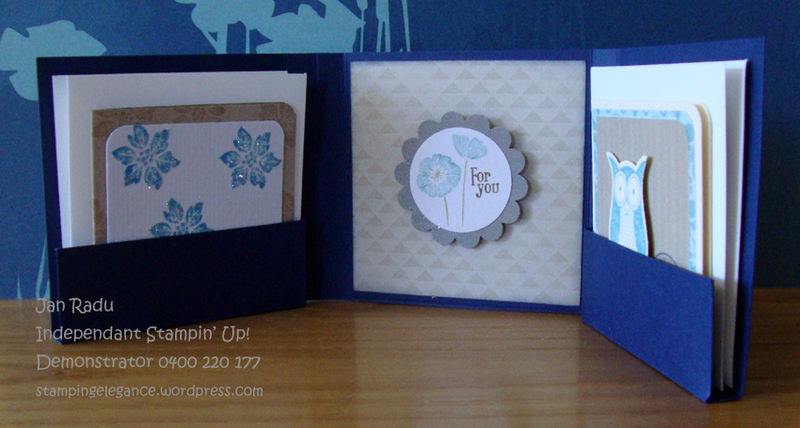 Ink the edges of inside DSP mat with Night of Navy and a Stampin’ sponge and adhere. Punch Scallop Circle in Crumb Cake and spray with Night of Navy Shimmer Mist – dry off with heat tool for quick assembly. Colour the For You stamp (SAB Punch Bunch) with markers Baja Breeze, Soft Suede and River Rock, stamp onto the REVERSE smooth side of watercolour paper and punch out with 1 3/8 circle punch. Adhere to scallop circle and attach to the inside DSP mat with a dimensional. Take your Watercolour mat and press the Crumb Cake inkpad down onto the ROUGH side. This gives you a really nice background effect. Ink the edges with Night of Navy and a stampin sponge. 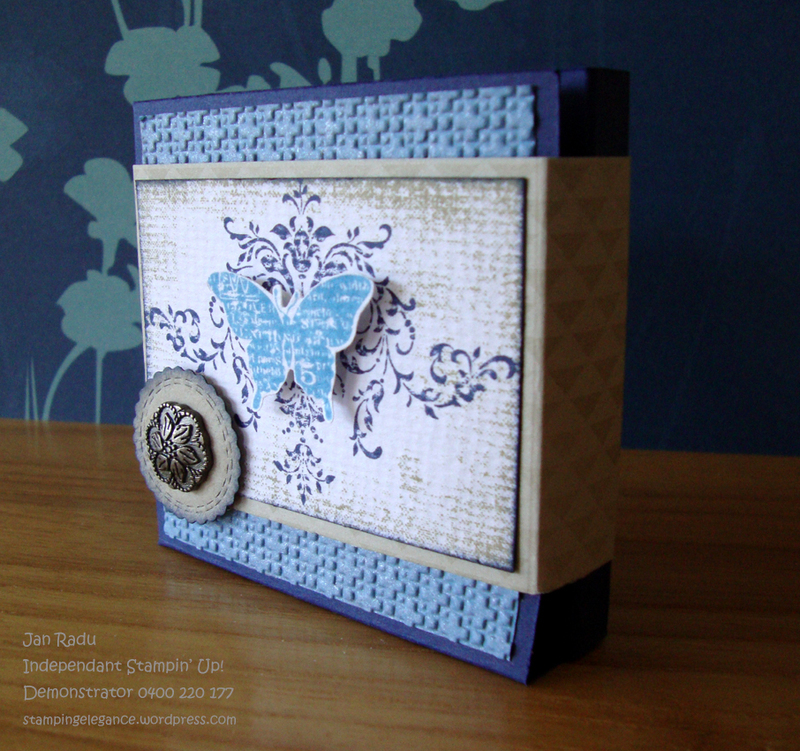 Stamp the butterfly in Marina Mist (SAB Bliss) on the REVERSE smooth side of a piece of watercolour paper and cut out with paper snips, then adhere with a dimensional. Attach an antique brad (Summer Mini) through the centre of the button shape and attach with a dimensional. On the back of the belly band, punch a Scallop Square in Marina Mist. 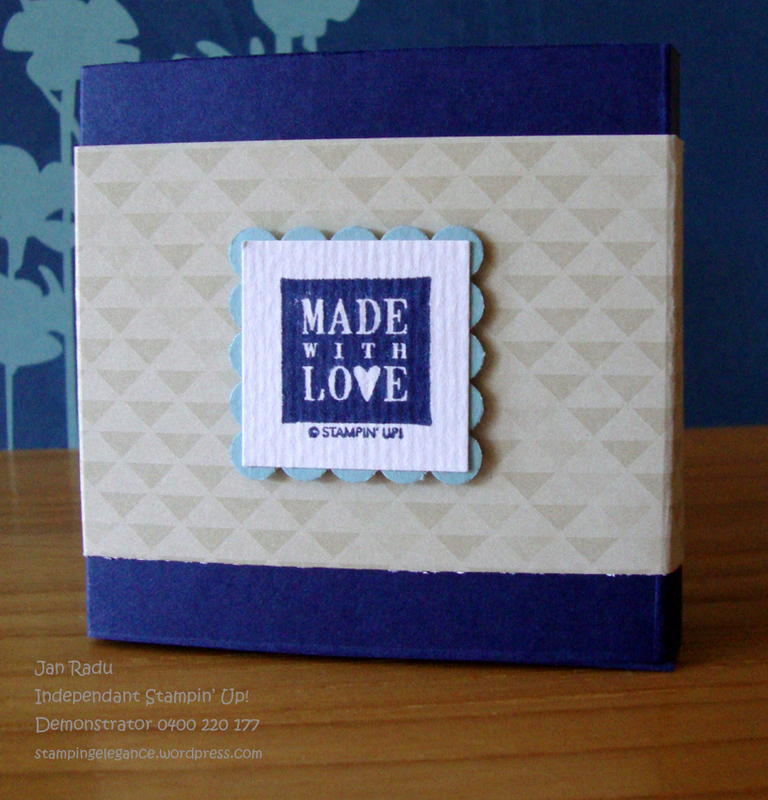 Stamp the Made with Love Stamp (Art By Design) onto the reverse of a piece of watercolour paper and punch with Square Punch. Adhere together and attach with a dimensional. Fold on score lines and join with sticky strip – careful not to join too tightly as it may not slip over your folder – it is useful to wrap around the folder and join when in place. 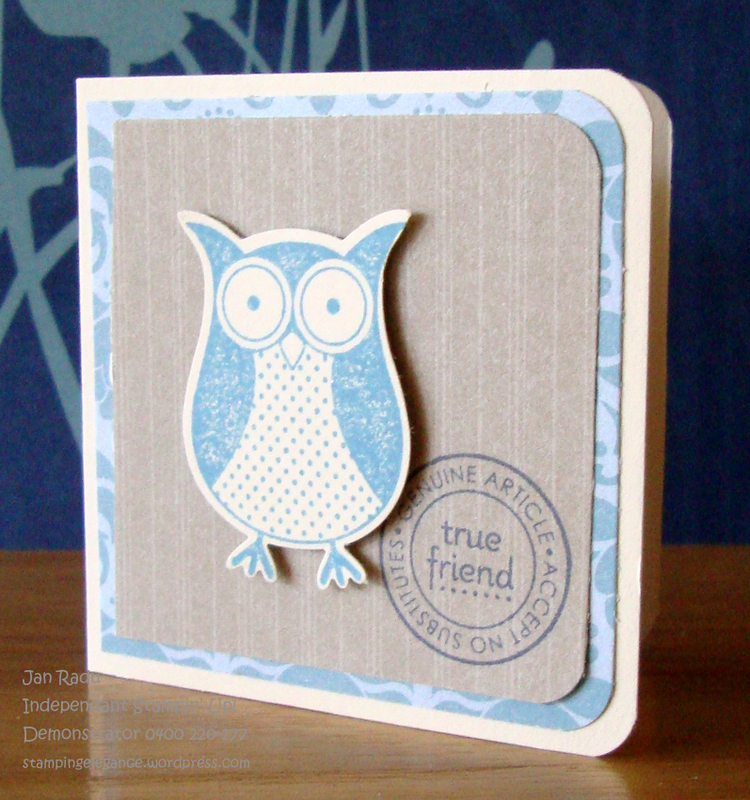 Stamp owl from (SAB Punch Bunch) in Marina Mist on Confetti Cream Card and punch using the owl punch. Adhere both DSP mats together (Greenhouse Gala DSP and Travel Journal DSP) and adhere to Confetti Cream Card. Adhere the Owl on a dimensional. 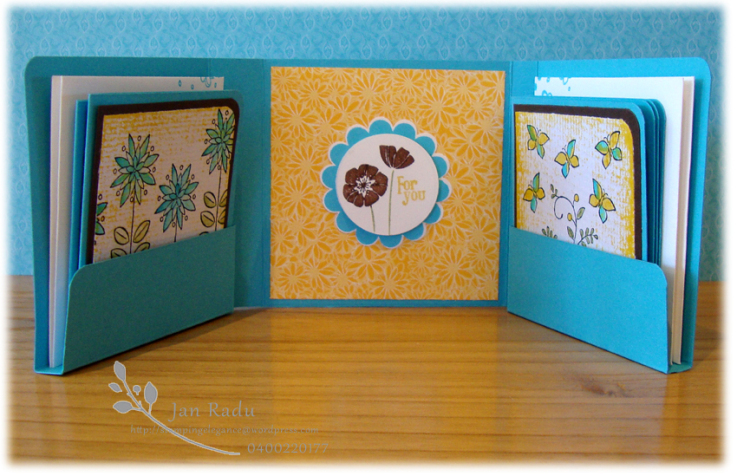 Stamp the Mini Envelope to match if desired. 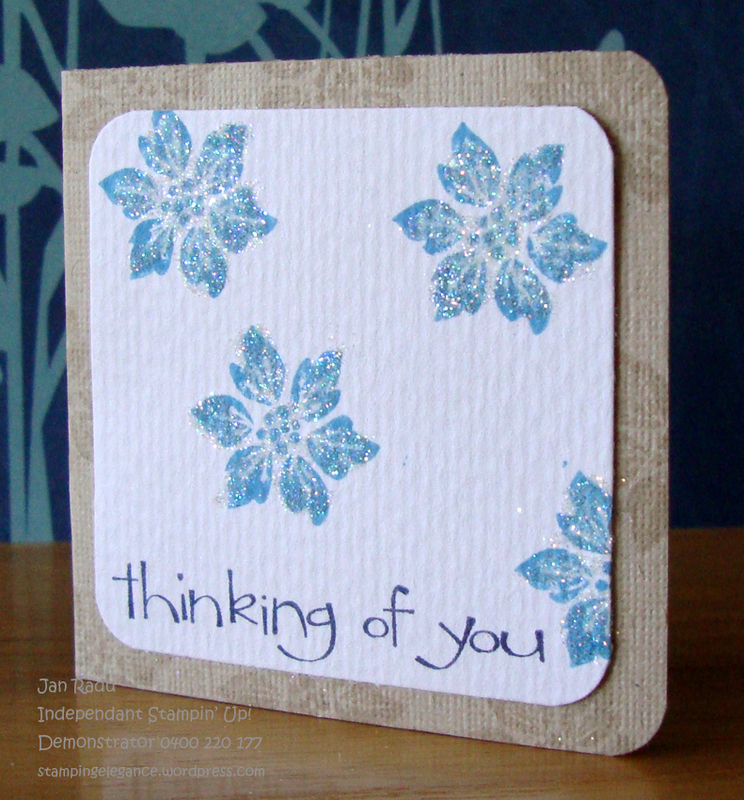 Add the thinking of you sentiment (SAB So Happy For You) in Night of Navy to the watercolour paper (use a stampamajig if you like). Stamp the same flower as above in Marina Mist all over. Use a 2-way glue pen to highlight parts of each flower and then sprinkle Dazzling Diamonds over the glue until all covered…SPARKLE! Press the Crumb Cake inkpad to the rough side of your watercolour paper. 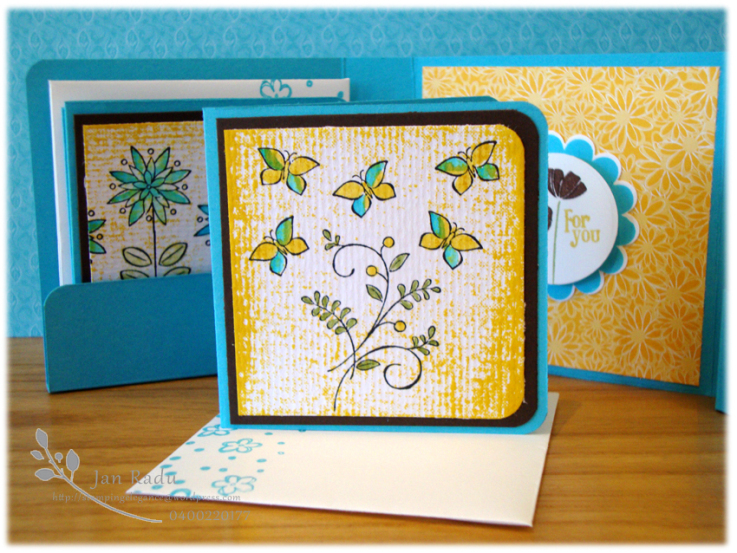 Stamp the flower combination in Black Stazon Ink – and add the bee! So cute! 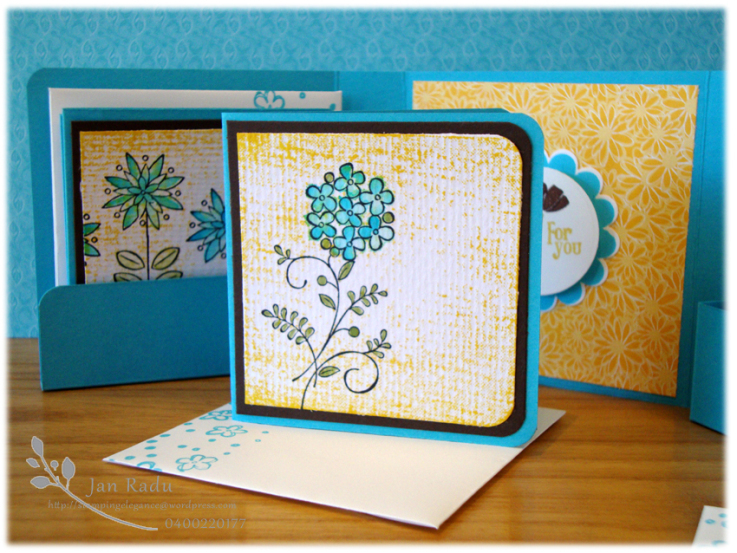 Use Stampin’ Markers River Rock and Baja breeze to highlight SECTIONS of your image. Then use an Aqua Painter to spread the ink around to your desired shading. Run the Marina Mist mat through the textured embossing folder and spray with Night of Navy Shimmer Mist. Dry off with heat tool for quick assembly. Adhere to card. 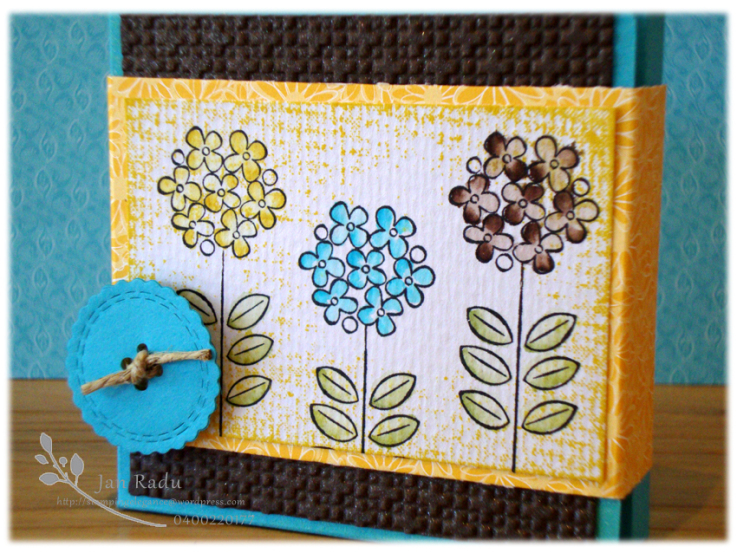 Punch Boho Blossoms from NEWSPRINT DSP, stack them and punch a hole in the centre. 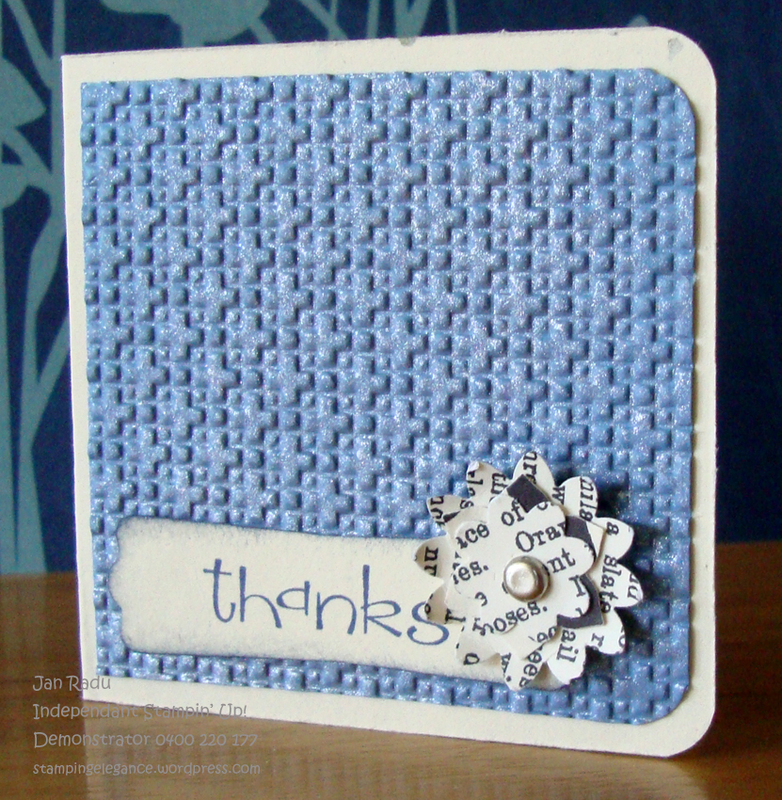 Stamp the Thanks sentiment (SAB So Happy For You) in Night of Navy on a piece of Confetti Cream and Punch using the Modern Label Punch. 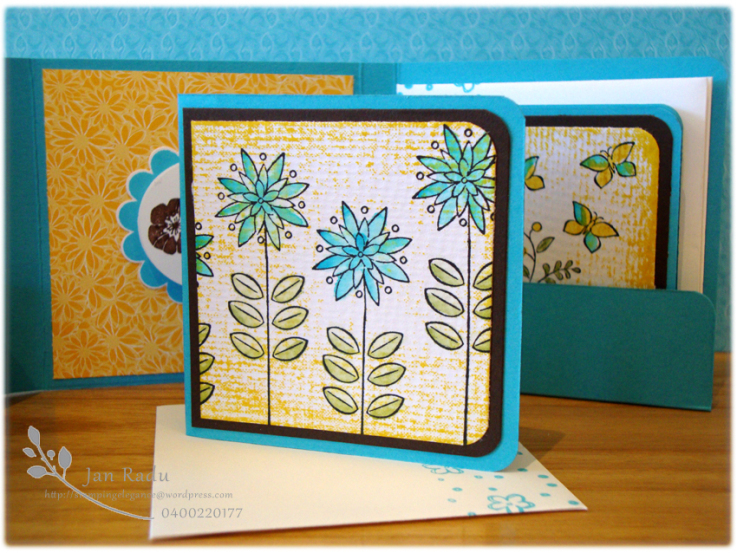 Attach the Boho Blossoms to the punched label with a small brad and attach to card (no dimensional here or the card will sit too high). Now you have completed the four cards, tuck them inside your folder with their envelopes and close folder with Belly band to secure! Can you imagine the possibilities? I plan on creating a collection of these to have on hand as personal hand crafted gifts for friends and loved ones – why don’t you try one today? 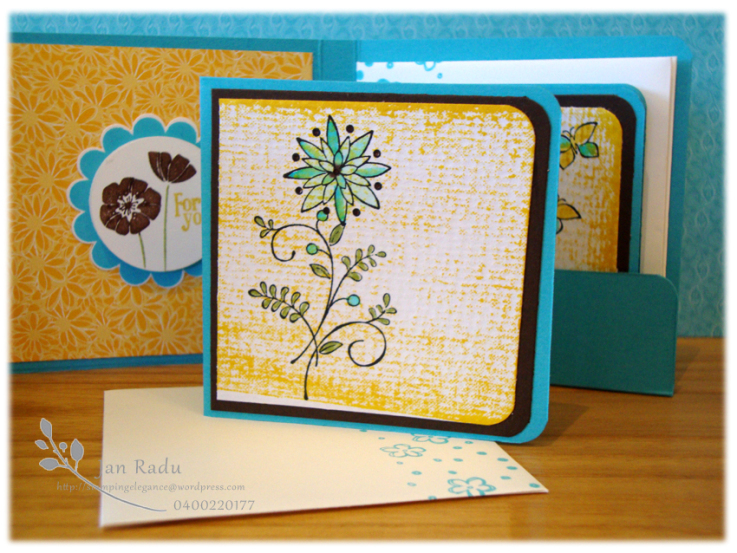 I’ve kept my cards free of sentiment so that they can be used for ANY occasion – and used one single stamp set – SAB Sweet Summer if you love these blooms as much as I do – you only have a little over a week to place a $100 order and receive your set for FREE!